A huge upgrade, cementing its status as the most authentic stage piano/organ/synth available. Very authentic organ, piano and electric piano sounds. Much improved synth section with arpeggiator and dedicated LFO. User sample upload and Nord Sound Library access. The improved sample uploading alone is worth the upgrade to this new model. MIDI spec improvements mean that the Stage 2 now hooks up to most computers and devices with ease. Nord's original Stage launched in 2005 and became a hit with live performers and studio bods with its great sounding organ, piano, electric piano and synth sections, coupled with versatile effects and controller functions, in a portable and easy to use package. We loved the review model so much that our reviewer bought one! "Nord listens to its customers and continually seeks to improve features, sounds and software." Thankfully, the Stage 2 doesn't stray from the original Stage's concept. The form factor and weight of all three models remains unchanged, though there has been some renaming - the Stage 88 is now the Stage 2 HA88 (HA stands for hammer action) the 76 is the HA76 and the Compact is the SW73 (semi-weighted). Perhaps this has been done so that the weighted 73 keybed (recently introduced on the Electro 3 HP) can at some point be offered as an option. The hammer action versions have also been tweaked and now feel much like the Nord Piano, which is a good thing. The downward key travel is fairly shallow and there is no sluggishness. The two weighted actions work well even for organ and clav playing, though the SW73 is the best option if clavs, organs and synths are more your bag, though it's still very playable for piano/EP. The Stage 2's interface is intuitive and one of the best around, with little reliance on the screen except for tweaking extra system parameters, but for most sound tweaking you needn't ever really look it. Having said that, we still wish the original stored patch parameter values would pop up when changing parameters. Regardless, so many keyboards we review are held back by unintuitive interfaces that get in the way of your creative flow. This is not the case here. Essentially, there was little to criticise with the original Stage/EX models though the biggest downside was the lack of user sample upload ability and Nord Sample Library access (as on the Electro 3). This has now been addressed and the Stage 2 can load user samples (beats, chords or any WAV files you like using the Nord Sample Editor) plus instruments from Nord's ever-growing sample library, extending its sonic palette infinitely. Simply load the Nord Sample Editor (Mac or PC), select any WAV files you wish, add them to the editor and create an instrument. Then load the instrument into the Stage 2 via USB or grab ready-made samples from the online Nord Sample Library. These samples can then be loaded into the synth and layered with the organ, piano or other synth sounds with little menu diving. This feature alone is reason enough to upgrade from the old Stage and ensures that the Stage 2 will still be sonically relevant years down the line. We're also confident that no other keyboard available has this much sonic power but is also this easy to use. The Stage 2 has much more memory than the old Stage/EX so it's possible to load in larger piano/EP samples and more of them, plus many of the samples now include a long release option and string resonance features, which add much to the authenticity of the piano samples, especially when using the new Nord triple pedal (optional). Press the soft pedal and the samples play more quietly, stamp on the sustain and cabinet resonance can be heard, plus harmonics come through too (sympathetic resonance) if you hold down the keys without striking them and then play a note, much as on a real piano. Coupled with the large range of new acoustic piano samples available from the Nord website, this is one of the best sounding piano engines available. Finally, the new 'slot detune' feature allows you to have two pianos, EPs, clavs or harpsichords (one on Slot A and one on B) and you can subtly detune them to add chorusing or phasing. There are many other key improvements in the Stage 2. The organ has been upgraded and now uses the latest version of Nord's tonewheel modelling technology. It sounds much more B3-like (as the C2), with better vibrato, chorus and percussion, while the rotary and drive emulation is also much improved. The EP samples, Clavinets, Harpsichords, Wurly and CP80 are still superb and some of the best we've ever played and there are many variations on these available free online to cater for most tastes and styles and plenty of memory to have several onboard at once. While the Kronos, which we reviewed recently, undoubtedly sounds great for pianos, EPs and as a synth, there is still a level of realism and musicality with Nord's samples that is unique. We're also digging the new synth section - it's easier to use than the old one and it's now based on the Nord Wave. It has the typical rich yet cutting Nord synth sound and we're pleased it now has a dedicated LFO, envelope controls and a simple but useful arpeggiator that all syncs to MIDI clock. There's also a new multi-mode filter, plus wavetables and a powerful FM synth. The only thing missing here is the old Stage's dedicated synth EQ but as the synth sounds so much better than the old one, it's not a big deal. The effects section remains largely unchanged, though now there are Jazz chorus and Fender Twin amp emulations (that sound much better than the old amp simulations) plus there's a new Univibe effect. Also, the delay effect can now be synced to the new master MIDI clock function, as can all the other effects. The MIDI spec has been pimped too (particularly with the latest 1.30 update) so the Stage 2 will communicate well with most MIDI equipment and computers. Again, it's clear that Nord listens to its customers and continually seeks to improve features, sounds and software. By now you've probably guessed that we rate the Stage 2 pretty highly. For experienced keyboardists it just feels good to play, it's portable and versatile and strikes the right balance of features and great sounds. 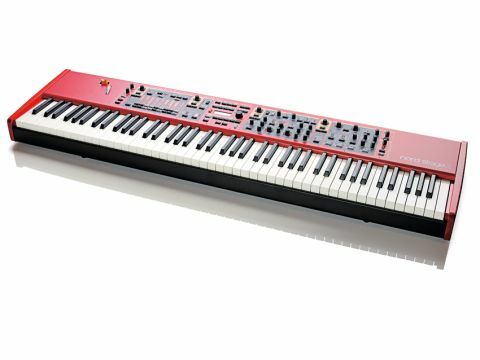 As a one-stop piano, electric piano, organ, synth and sample playback instrument, the Nord Stage 2 is hard to beat.